The development of any successful and effective treatment plan requires an in-depth knowledge of each patient’s smile, including the gums, jaw bone, and connective tissue. 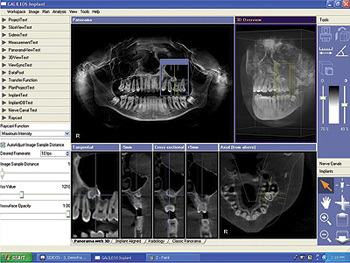 To ensure patients are receiving the accurate treatment plans that comprehensively address all aspects of the dentition, Alexandria dentist Dr. Leo J. Rosenthal utilizes the cone beam computer tomography. With this three-dimensional diagnostic imaging tool, our dental team is able to fully capture each element of your dentition, monitor your smile for changes, and plan effective treatments to ensure lasting oral health. 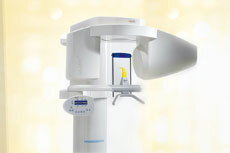 Also known as a CBCT scanner, this innovation in dental technology represents the future of diagnostic imaging. Unlike traditional radiography that requires uncomfortable bite wings, patients undergoing CBCT scans simply stand still while the camera arm rotates around the head, capturing multiple images of the dentition from different angles around the head. The images are then used to create a three-dimensional image of your entire mouth, including the supporting bones, tooth roots, and teeth. What Are the Advantages of CBCT Scanning? As the scan provides Dr. Rosenthal with a total mouth evaluation, our Alexandria dentist is also able to identify your dentition for changes and potential issues. Early identification and the immediate creation of appropriate treatment plans can help limit the damage these conditions may cause while ensuring uninterrupted dental function and oral health. The use of CBCT scanning also fosters better patient education. As three-dimensional models can be created with this tool, patients are able to better understand the unique features of their smile, allowing them to make more informed decisions about upcoming dental treatments. At his state-of-the-art dental office in Alexandria, Dr. Rosenthal frequently integrates advanced technologies into routine and complex dental care, providing patients with world class dentistry in a comfortable, relaxed environment. With CBCT scanning, our Alexandria dentist can help you achieve a lasting, healthy, and beautiful smile. To schedule your next dental appointment, contact our dental office today.